Americans like to believe that with hard work they can move up the earnings ladder -- but that's more difficult to do if you live in the South. A recent study from Pew's Economic Mobility Project finds that most Southern states have lower upward mobility and higher downward mobility than the nation as a whole. "When it comes to achieving the American Dream, it matters where you live," said Erin Currier, project manager of Pew's Economic Mobility Project. "Understanding that mobility rates differ by state is the first step towards helping policy makers pinpoint what enhances their residents' mobility." Besides Oklahoma, all of the states with lower upward and higher downward mobility are in the South: Alabama, Florida, Kentucky, Louisiana, Mississippi, North Carolina, South Carolina and Texas. 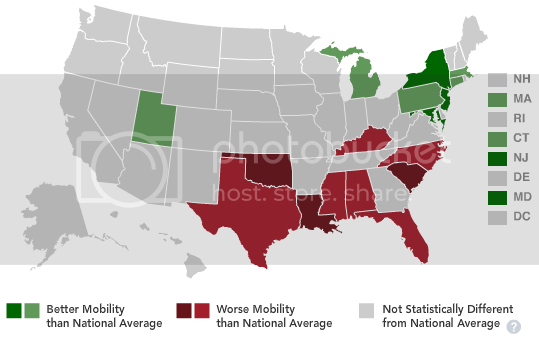 Louisiana, Oklahoma and South Carolina have the worst mobility scores. Eight states -- primarily in the Mid-Atlantic and New England regions -- have higher upward and lower downward mobility than the nation as a whole. They are Connecticut, Maryland, Massachusetts, Michigan, New Jersey, New York, Pennsylvania and Utah. In other words, geographic mobility -- whether people born in a particular state stayed there or moved elsewhere -- does not drive overall state differences in economic mobility. It does matter, however, on an individual level; those who moved out of their birth states had better mobility outcomes on average than those who did not. The study focused on Americans in their prime working years, looking at earnings averaged for people between ages 35 and 39 and measured between 1978 and 1997. It then looked at how earnings for the same people rose or fell 10 years later. For more details on the study, and for an interactive version of the map above, click here.